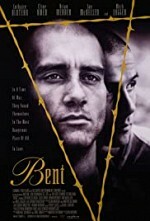 Watch Bent: Max is gay and as such is sent to Dachau concentration camp under the Nazi regime. He tries to deny he is gay, and gets a yellow label (the one for Jews) instead of pink (the one for gays). In camp, he falls in love with fellow prisoner Horst, who wears his pink label with pride.